Today, after we finished some of our camera tracking stuff, we programmers had some free time. Since it is imperative that the climber we decided to use(the toothed "hedge-trimmer") has both motors run at exactly the same speed, give or take, we decided to start working on the code for it. The only problem is, as with anything, the programming cannot be tested until the hardware is complete. So, we decided to mock up the potentiometer system that we'll be using to drive the climber, in order to complete the algorithm by the time the device is ready. 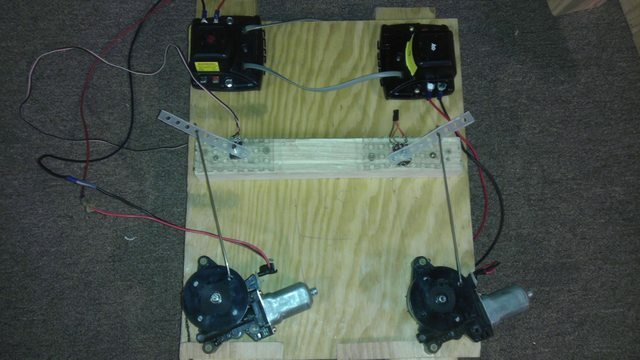 Here's what it looks like(our mock-up, not the actual thing), the two motor represent the motors driving the separate sides of the climber, and the potentiometers are mounted to them by a coat-hanger that we decimated. Our goal is to make the plastic strips attached to the potentiomenters wave back and forth together. We got the code working for Arick's climber design, here's a video of us demonstrating it on an electrical board. Nordic Storm is FIRST Robotics Competition (FRC) team 3018 from the St. Peter, Mankato, and Lake Crystal area.